Russia’s strongest man, Elbrus Nigmatullin, has pulled a 30-ton two-story wooden house over a distance of three meters, setting a record he says to be the hardest in his sports career. The four-time Russia’s Strongest Man title holder, 41-year-old Nigmatullin has once again wowed spectators in his hometown of Chelyabinsk. 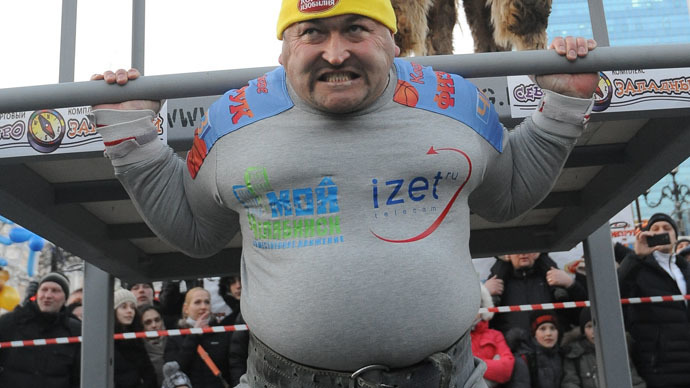 Supported by a cheering crowd, the 180cm tall power lifter on Tuesday managed to pull the real two-story country house off its foundation. Especially build for the competition, the wooden cottage took five days, dozens of workers and construction equipment to erect and set on a custom foundation. The 30 ton structure with furniture inside was placed on pipes while a special "railroad" was set up for the convenience of the athlete. Nigmatullin using, all his strength and 130kg weight, dragged the cottage for some three meters. “When I first approached this house, I was only 30 percent sure that I could make something happen. But when the eyes are afraid, the legs keep on going,” Nigmatullin said after becoming the first person in the world to move a standing country cottage. The strongman now plans to head to Feodosia, where he will join an athlete from Crimea, Jamshid Ismatilaevym, in an attempt to pull a ship weighing some 1.5 tons. Strength athletics, more generally known as strongman competitions, is a sport which tests competitors’ strength in a variety of different ways. The typical equipment used in each event are “everyday” objects that the general public can relate to such as cars, barrels, refrigerators, boats and trains.